List of Almeria Province Bowls Lawn Clubs. 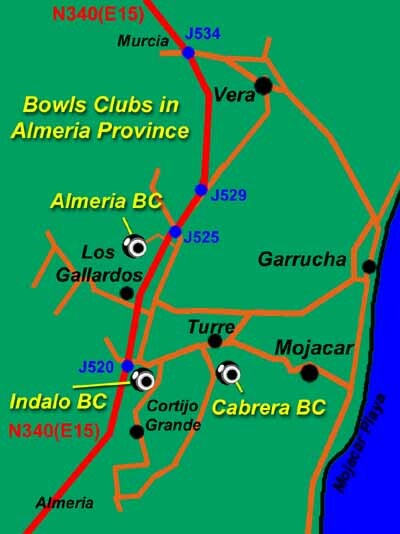 The four active Bowls Clubs in Almeria province are all located within 10 minutes drive of Mojacar, a picturesque village, however only 75 kilometres from the capital city, Almeria. Most visitors will probably want to stay at one of the many hotels, or apartment complexes located along the 8km. long Mojacar Playa. You can reach Almeria City by air or train. The N340 (E15) motorway passes very close to the Mojacar area. Click above for Discounted prices of Hotels on The Costa Almeria in Spain. On the N340(E15), travelling north or south, exit at junction J520 and follow the sign to Los Gallardos. At just over 4 KM turn left at a tunnel. Exiting from the tunnel, turn left and follow the unkempt road to Los Gallardos Camping Site. From the J520 junction follow the sign to Mojacar Playa/Turre for about 1 KM. Look for a small sign to Indalo BC on the left side of the road. Turn right at the sign and follow the unkempt road to Indalo BC. From the J520 junction follow the sign to Mojacar Playa/Turre for about 6 KM. Finally just before reaching the village of Turre, turn right at the Al-Andalus Gardens sign. Now just Follow the road for another 1 KM and then turn left at Al-Andalus Gardens. Canada de la Piedra, Los Gallardos, 04280 Nr. Mojacar, Almeria. Click ABOVE for Accommodation Hotels Apartments and Guest Houses Villas in the-Costa Almeria area in Spain. “Crowood Sports Guides” will provide sound, therefore good practical advice that will help make you a better sportsperson whether you are learning the basic skills. After that discovering more advanced techniques or reviewing the fundamentals of your game. Being a brand new bowler I found this a very good read giving rhyme and reason to understanding the sport. Also some very good photos to back up words.Its certainly helped me to come up with plan to succeed and enjoy bowling. 5 Star book for me.also lent the book to a friend that’s been playing for years and he found it to be a help as well ” good to go back to basics ” was the comment. I would like to see a video section for Kindle readers as this would be a great help.